Cupcakes 'n Daisies: Seven Snowmen . . . . Seven Snowmen is one of the classes I took at the Buggy Barn. The class was taught by the pattern's designer, Bonnie Sullivan. I signed up for the class because I had a free day and a curiosity about wool. I'm now so glad I gave it a try. 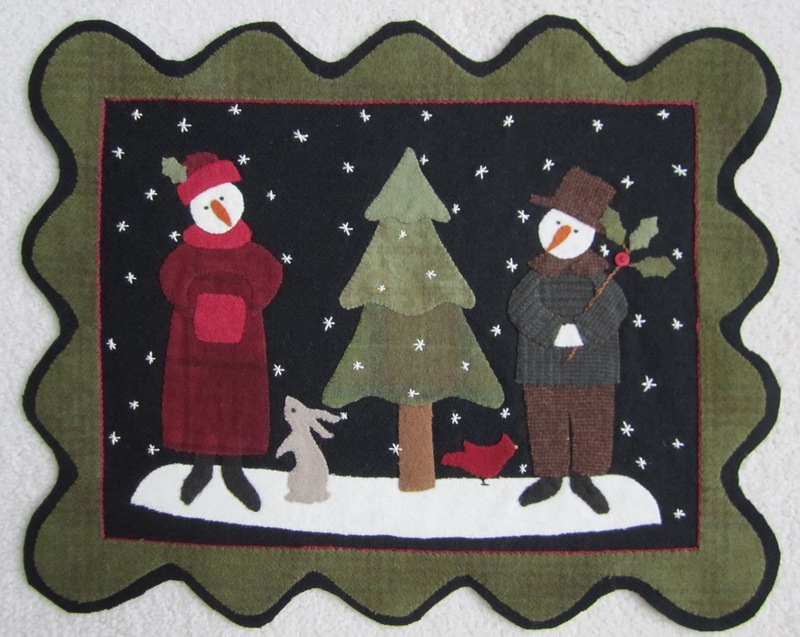 The pattern has two options, the seven snowmen table runner or the penny rug. Our class worked on the penny rug. This is how my project looked after class. I was still in the snow people voodoo doll stage. And this is how it looks now, all done! This is lifetime wool project number 1, and no, I'm not going to keep track of my wool projects like my quilts, but I am very pleased with how it looks, especially for a first project. Guess I had a good teacher. I never could figure out how to stitch the design on the snow lady's hat, so I added a holly leaf. Good thing I had kept all my wool scraps! The cardinal is supposed to be tilted up a tad and looking at the snowman, and not posed like he's about to attack the snowman's shin, but it makes me smile instead of annoy me, which isn't like me at all! The whole time I was working on this project I was worried about those carrot noses and the french knot eyes, and saved them for last, they all worked out fine, no problems at all. I am particularly proud of my red outline stitch next to the green inner border, my first attempt of an outline stitch and it looks really good, and is a nice little touch. Since I'm not much of a stitcher, I found the back of the pattern cover very helpful, a nice little primer on a few basic stitches. This might be a standard thing for wool patterns, since this is my first and only wool pattern I have no idea. But if my next project doesn't provided this information I'll be sure to get this back out. I found working with wool enjoyable. If you select the correct color of thread, the wool is very forgiving. I don't think this will be my last wool project. I've seen some interesting quilt patterns that incorporate wool, I pretty much ignored them since I didn't know how to work with wool, I'll be paying closer attention to those patterns now. Very cute, Thelma! I like the idea of working with wool, but I've still never gotten up the courage to make the leap into applique, so it may be awhile before I try it. But you are, as always, an inspiration! Looks great! I'm not much of a stitcher either. But I love to admire others works with the medium. Voodoo doll stage. You made me spew coffee from my nose! Bwahahaahahaha! Love it! You did a wonderful job! I hear that working with wool can be addicting... and fun! It's fabulous! Love the shin attacking bird! LOL I haven't done anything with wool either...yet???! You made a beautiful first wool project! It's so cute! Watch out... it can be addicting! But if working with wool doesn't turn into a full blown addition for you, isn't it nice to know you like it enough to try it again? What with Voodoo Snow Folks and a Killer Cardinal how come your Penny Rug looks so cute. It's totally gorgeous! I'd love to try working with wool too.... maybe soon. I am a wool addict...I have the 7 santa's must get the 7 snowmen!!! Glad you had fun! I had seen that pattern and thought it was so cute! It is even more adorable made up! Wonderful work Thelma! Yes, I laughed a bit out loud too when you mentioned the shin attack. Not good for someone who is at work and suppose to be crunching numbers! Your project looks great! The red outline really is a perfect addition. I really, really like that. Now when I look at that cute little cardinal, I have to chuckle...he doesn't look so innocent anymore. I have never worked in wool. Yours turned out so lovely that I may be tempted to try it out. Well, by golly, now maybe I'll take a wool class. Thanks for inspiring us all! What a great first project. I love working with wool. Save all of your tiny scraps - you will be surprised how far they go on your projects. I just finished my first wool project. Love yours, might have to get that pattern. Your penny rug turned out beautifully! I do a lot of wool applique and I've never seen a pattern that puts all the stitches on the back like that~how thoughtful and a nice handy reference! Love how your project turned out! I think it's so funny you think of the cardinal pecking his shin...that's what I would think too :) I'm sure there will definitely be more wool projects in your future, can't wait to see them! Just love these snowmen ! What s great first wool project for you ! LOVE IT !! !